y’all, i am so excited to share these cookies with you! as i’ve mentioned before, i’m not the hugest sweets fan – most times, i prefer something savory or salty over a sweet. these homemade oatmeal + marshmallow creme pies, though, brought out a crazy, sweets-lovin’ maniac in me. and everyone i shared them with, now that i think about it. =) they’re incredibly decadent + absolutely wonderful. the oatmeal cookies themselves are perfect – buttery + soft, with just the slightest hint of crispiness around the edges. 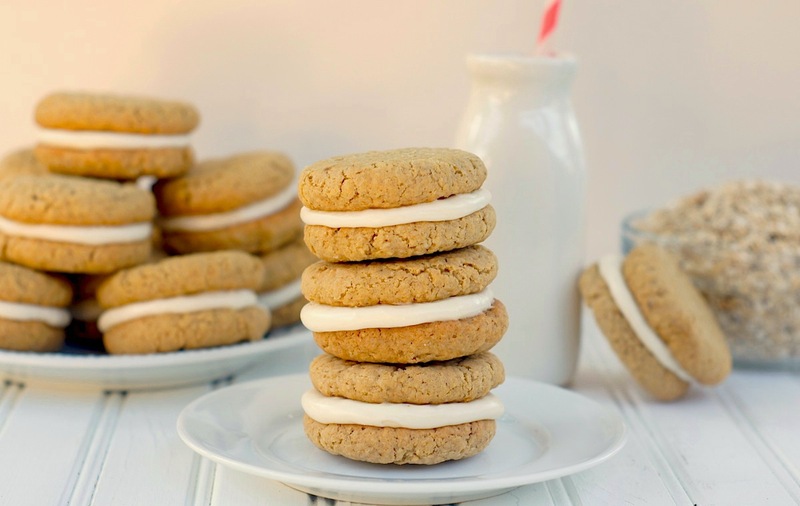 they are fantastic just on their own – they’ll be my go-to oatmeal cookie recipe from now on – but they’re even better made into sandwiches with marshmallow buttercream. the marshmallow filling is on the sweeter side, which complements the rich, less-sweet oatmeal cookies in a glorious way. after i made these, i made myself give most of ’em away because i feared i couldn’t resist eating them in massive quantities. that’s how amazing these are – you gotta try ’em! preheat oven to 350 degrees. line baking sheet with silpat mats or parchment paper. in a large bowl, or the bowl of a standing mixer, cream the butter for about 30 seconds, then add both sugars + beat until light + fluffy. add the eggs + vanilla, mix well, + scrape down the sides of the bowl as needed. in a medium bowl, combine the flour, cinnamon, baking soda, + salt. add the flour to the butter mixture in 3 increments until just combined. stir in the oats until evenly distributed. drop 2 tablespoons of dough (about the size of a golf ball) onto the pan at a time, about 2 inches apart. bake for 10-12 minutes, until golden. allow to cool on the baking sheet for 2 minutes before transferring to a cooling rack. cool completely before filling with the marshmallow creme. assemble the sandwiches: place 1 – 2 tablespoons of filling on the bottom of a cookie, then place another cookie, bottom side down, on top. continue until all cookie sandwiches are made. I could eat like 16 of these in a row – no lie. Love this. your go-to oatmeal cookie recipe from now on? that alone makes me want to try them. I am constantly looking for new oatmeal cookie recipes to try – they are my favorite kind of cookie! I am a sucker for creme pies too. they remind me of when I was little! you’ll have to try this cookie recipe, then – they really are fantastic! 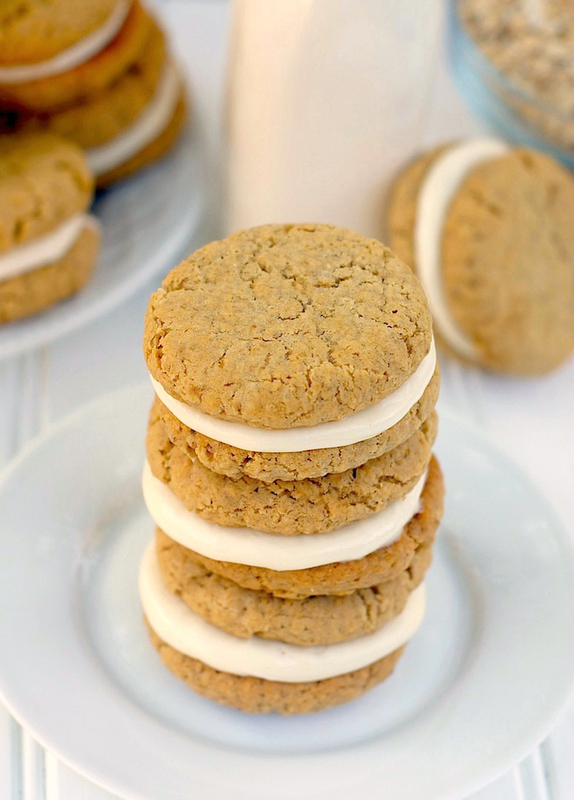 Oatmeal cookies are my favorite in the fall (I dunno), and these sandwich cookies are perfect! Totally a sweets person here These look amazing, so much better than the store bought packages version! I’ve always wanted to make these, but could never find an icing without shortening. Thank you for realizing my cookie dream. This marshmallow creme looks so delicious! these are amazing! i love both salty and sweet things i guess that means i eat everything?! i like to have salty things like chips, but also like to end each evening with a sweet dessert. Ooooo, yum! These look absolutely delicious. I wish I were more like you, a salty and savory kind of gal, but I just love me some sweets. I can’t wait to make these! Amy, these look so perfect!!! I want like three of them!